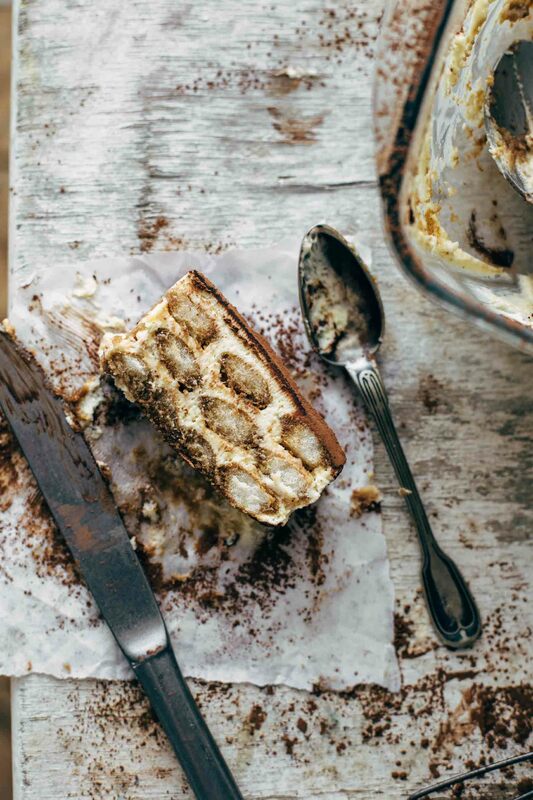 This authentic Italian Tiramisu recipe is super easy to make. Fully translated from Italian into English and calculated in cups and grams. Just 6 ingredients and 10 minutes prep time. With video! Have you ever been to Italy? If not I highly recommend it to you. Italy is a lovely country. I can’t say what I loved the most about Italy, but their food is probably the thing I’ve enjoyed the most. Italian food is so diverse and flavorful. Neapolitan pizza, seafood, and Tiramisu were my favorites. I know pretty obvious. But they are known for this food, and I can say for sure that pizza or Tiramisu doesn’t taste that awesome anywhere else. At least not here in Austria. It is like I say that you can eat the best burger or cookies outside the US. Nope. Not possible. Never had anywhere else a fantastic burger than in the US. And the best Schnitzel is in Austria. That easy. I love to experiment with Tiramisu. I’ve been working on a Tiramisu cookbook for weeks. 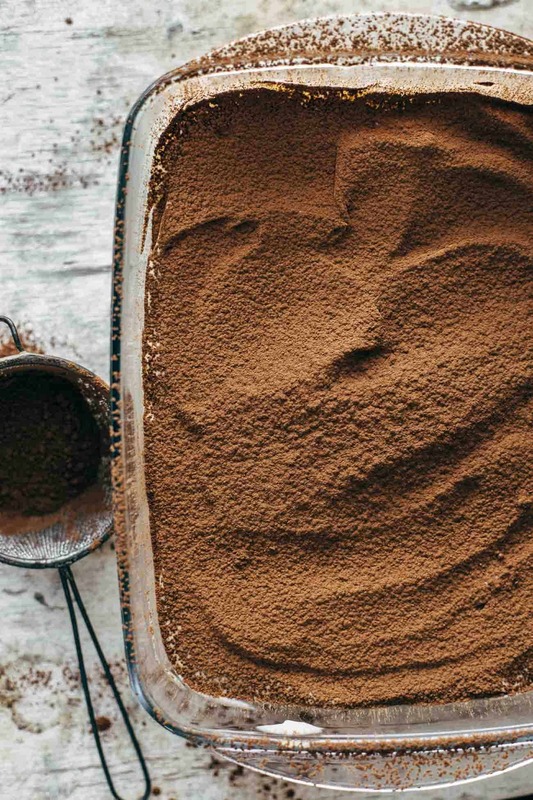 But everything started with this authentic Italian Tiramisu recipe. And this was it. This changed everything. 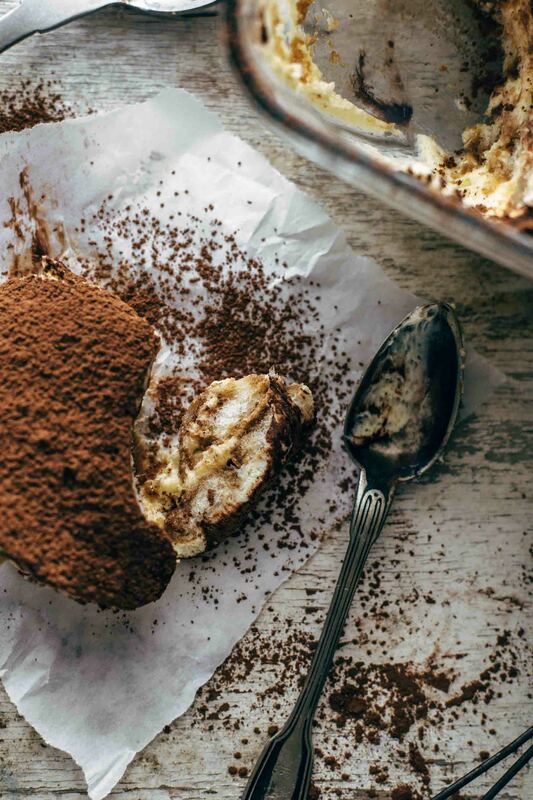 This Tiramisu recipe is an original Italian recipe. I fully translated it from Italian into English and calculated it in cups and grams. Authentic Italian Tiramisu has just 6 ingredients. Ladyfingers, strong coffee, mascarpone, egg yolks, powdered sugar, and unsweetened cocoa powder. I know that different versions of Tiramisu are existing. Some have whipping cream in it. Some of them Amaretto or rum. In my future Tiramisu cookbook, you are going to find Tiramisu with whipping cream, with alcohol, without coffee, etc. They are all delicious. There is no doubt. But original Tiramisu has no whipping cream nor Amaretto. I know that it is very popular to add Amaretto to the Tiramisu, and I truly understand why, but this is not the original Tiramisu recipe. Authentic Italian Tiramisu contains, like I said, egg yolks. Raw egg yolks. I don’t know how often I had Tiramisu and I never had any problems with foodborne illness. Of course, there is always the risk that you are unlucky and buy some contaminated eggs. No one can know this. I recommend using just fresh eggs. If the yolk or the egg white is too runny or smells, please don’t use it. Don’t get me wrong, I always recommend using fresh eggs, but when eaten raw, you need to pay even more attention to this. If you are afraid of eating raw egg yolks, then leave them out. In this case, just mix the mascarpone with the powdered sugar. When you have any experience with pasteurized egg yolks, you could try using them. I don’t have any experiences, and I don’t know if the egg yolks are getting white, pale, and creamy when mixing. When they don’t, the mascarpone cream would be too liquid. You can add 1/2 cup whipping cream at the end to replace the egg yolks. 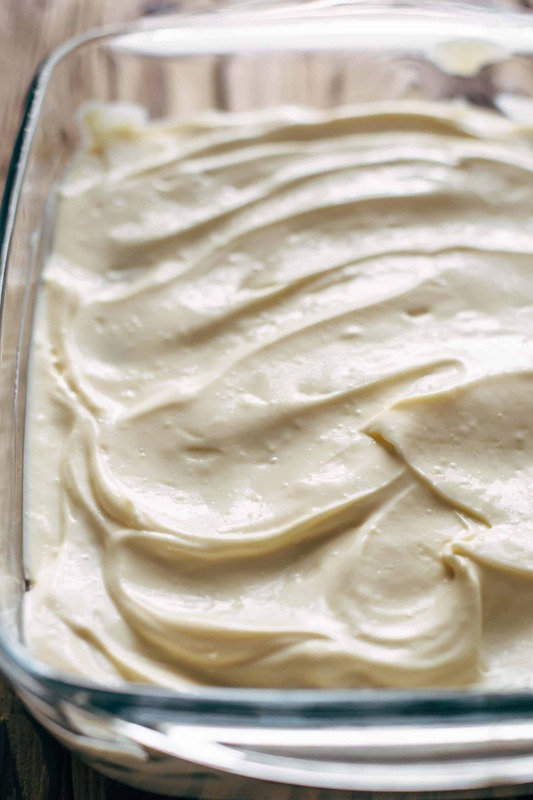 If you don’t add whipping cream, I recommend making just 2 layers instead of 3 because it is too less cream for a three-layered Tiramisu. Start with a layer of ladyfingers. Dip about 12 ladyfingers and arrange in the bottom of a 9x7x3 or 8x8x3 inches casserole until fully covered. I don’t recommend soaking the ladyfingers in coffee. It makes the Tiramisu too wet. Just dip them on both sides very quickly. Then spread 1/3 of the mascarpone cream on top. Repeat 2 more times. You end up with a layer of mascarpone cream on top. There are many recipes with just 2 + 2 layers, but original Tiramisu has 3 + 3 layers. I recommend wrapping the casserole very tightly with plastic wrap, that no air or smell from the fridge can go inside the Tiramisu. Refrigerate at least 4 hours preferably overnight. Tiramisu is much more delicious on the second day. The taste and the consistency is getting better and better the longer it has time to rest. 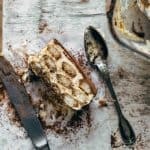 You can store Tiramisu in the fridge up to 3 days. Before serving dust with unsweetened cocoa powder. Ciao Bella! 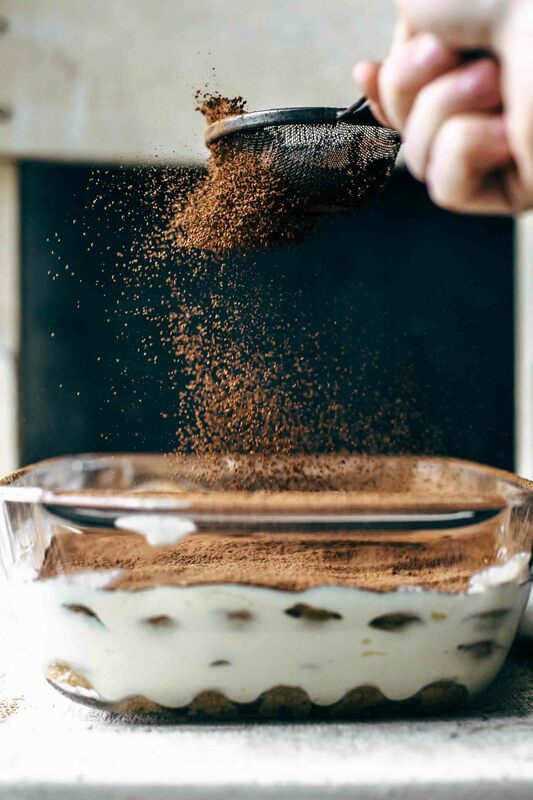 If you make this Authentic Italian Tiramisu recipe leave a comment, rate it and tag a photo #alsothecrumbsplease on Instagram! Would love to see your snap! 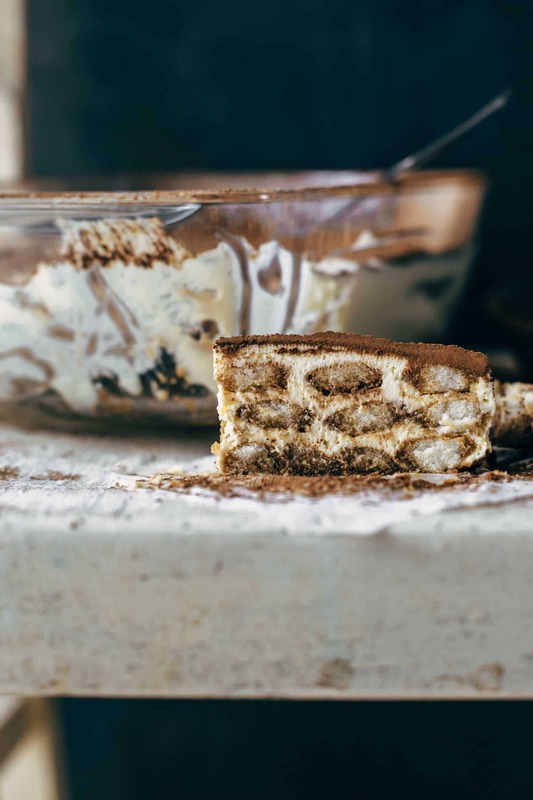 If you love Tiramisu, scroll down, subscribe to my newsletter, and get an exclusive Tiramisu e-cookbook with 10 Tiramisu recipes for free! In a large mixing bowl using a handheld or stand mixer fitted with a whisk attachment, beat egg yolks and sugar on medium-high speed until white and creamy and sugar is completely dissolved, for about 2-3 minutes. Add mascarpone and mix until smooth and creamy, for about 2-3 minutes. Dip ladyfingers on both sides very quickly into coffee and arrange about 12 ladyfingers on the bottom of a 9x7x3 or 8x8x3 inches casserole. Spread about 1/3 of the mascarpone cream on top. Repeat two more times ending up with a layer of mascarpone cream on top. Wrap casserole with plastic wrap tightly that no air or smell from the fridge can go inside the Tiramisu. Refrigerate at least 4 hours or preferably overnight. Dust with cocoa on top just before serving. Store leftovers in the fridge up to 2 days. If you are afraid of using raw egg yolks, read blog post above for substitution. I just stumbled on your blog and I am so glad that I did! All of your recipes look like they are things I would absolutely love! I have a request! This month is “Poland” month for me and my family and I would love to try a good Polish recipe. Something either sweet or savory. I figured you would be the person to ask! Hi Catherine, thanks for stopping by! I’m glad that you like my recipes. The only Polish recipe I really know well and can recommend is Pierogi. My grandmother does them all the time. It is a sweet or savory filled dumpling. Savory Pierogi are traditionally filled with potato or sauerkraut, and ground beef. Sweet Pierogi are filled with fruits like apricot or strawberries for example. If you are interested, I can ask my grandmother for the recipe! Thank you so much for your kind response! I would absolutely LOVE your grandmother’s recipe!!! Thank you! Also, side note: I have family in Schoppernau, Österreich. I have had the great pleasure of visitng a few times. I miss it! I ask her and will send it to you via email! Oh great, Austria has a beautiful landscape. Have a great day! Just my family is doing a month of Poland. We are Catholic and chose St. John Paul II as our Saint for the year for our family. Each month I pick a theme that relates to his life and I read about his great love for his homeland. Thank you very much for the information about Paska bread! Do you have a recipe in English? Are you dipping all of the ladyfingers or just the bottom layer in coffee? Hi Deanna, I dip all ladyfingers in coffee. excited to try it. do you have a favorite // recommended brand of lady fingers? often times i find them too coated in sugar! thanks in advance. I don’t have a preferred brand of ladyfingers. However, the Forno Bonomi Savoiardi and the Whole Foods Organic are great though. Because of the strong coffee and the amount of mascarpone, it’s great to have the sugar crust to sweeten up the Tiramisu. Hope that helps!